Plus: New Jersey Bankers support veterans, $1 million given in scholarships, and more. Each month, New Jersey Monthly’s Giving Back page features photos taken at various charitable events across the Garden State. The following snapshots were featured in the June 2016 Shore Guide issue. Photo courtesy of Don Christensen. New Jersey Bankers Charitable Foundation made a $10,000 contribution to Rider University’s Veteran Entrepreneurial Programs. There to celebrate were, from left, Daniel Klashner and Jorge Ditren, Rider; John Fitzgerald, Magyar Bank; Ron Cook, Rider; Gerald Reeves, Sturdy Savings Bank; Robert Stillwell, Boiling Springs Savings Bank; James Silkensen, Somerset Savings Bank; Angela Snyder, Fulton Bank; John McWeeney and James Meredith, NJ Bankers. Husband and wife, Pam Ruoff, left, and Kirk Ruoff, right, of Turning Point Restaurants, presented a $57,389 check to Rich and Kristen Gillette of the Kortney Rose Foundation. Turning Point’s 11 locations have helped raise more than $180,000 over the past seven years to support the foundation, which raises funds for pediatric brain tumor research. Springfield Deputy Mayor Ziad Andrew Shehady, right, delivered meals to older adults alongside volunteers John and Cocoa Catallo as part of the Meals on Wheels America’s March for Meals campaign. 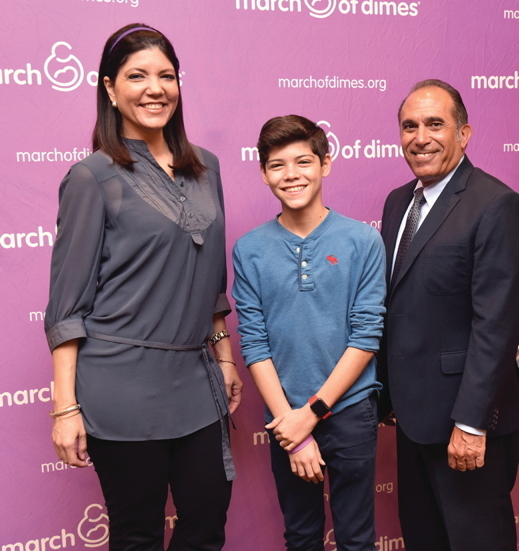 March of Dimes National Ambassador Ismael Torres-Castrodad, center, spoke at the PSEG March for Babies kickoff event. There to support him were his mother, Isamari Castrodad, left, and Jorge L. Cardenas, PSEG vice president. Sandra Florent, left, and Pete Gardner, right, of Kings Food Markets, presented a $500 check to, from left, Karen Russo, Charles Crosby and Mary Betsy of Boonton High School to support the school’s Project Graduation. St. Peters’s University in Jersey City received a $1 million gift for scholarships from Give Something Back Foundation (GSBF). Joined by students to celebrate were, from left holding check, Anthony de Nicola of Welsh, Carson, Anderson & Stowe; Jersey City Mayor Steven Fulop; Robert Carr, GSBF; Robert Niehaus, GCP Capital Partners; and Eugene Cornacchia, president of St. Peter’s University.